The Lord is good. At all times. He cannot be anything less than good because it is not just something He does, or an attitude He has adopted. He IS good; just as you are male or female. It is something you are, not a role you play or a job you do. In the same way God is goodness. He embodies the whole notion of goodness. It exists only because He exists. If we know and believe that God is good always, then we can trust Him with our lives. His plan for us is always good, always to benefit us. Does that mean bad things will never happen to those who believe in God? Of course not. Your own experience proves that. Just look around. Bad things happen to God’s beloved children every day. There is sin, death, and evil in the world and God, for reasons we can’t fully understand, allows evil to happen. When we do experience pain, tragedy, loss or ruin in our lives that does not change the fact that God is still good. Because He is always faithfully, unchangeable good, we can turn to Him in times of trouble with absolute trust, knowing for certain He will be there to comfort, to heal, to provide. An acquaintance of mine recently lost her young granddaughter to cancer. Through her tears and despite her devastated heart, she was still able to proclaim “God is good.” No, the circumstances were not good. There is no good in the death of a precious young child. She was acknowledging that separate from any situation in our life, God himself is still good. He is faithful. He is trustworthy. He is unchanging in His love and compassion for us. We praise Him for who He is, not for what happens in our life. Yes, we should thank Him for all of our blessings because all that is good does flow from Him, but we praise Him for who He is, irrespective of our circumstances. Is a rose any less beautiful on a rainy day? 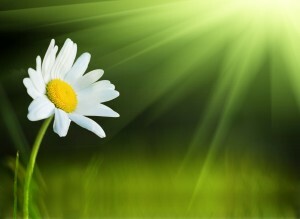 We acknowledge and appreciate the beauty of a flower because it is beautiful, not because our day is sunny. In the same way, we can glorify God and declare His beauty, His goodness, and His love regardless of what is happening to us. Amazing things happens though when we put our focus on God and choose to dedicate our hearts to worshiping Him in spite of our situation. We draw nearer to Him in that moment and He responds to our worship. Suddenly we find ourselves at peace in the midst of our trial. We discover a comfort and assurance that goes beyond all understanding. When we open our hearts to God, The Holy Spirit comes in and brings love, joy, peace, patience, kindness, goodness, faith, gentleness, and self-control into our life. All that we need, whatever we need, in that season of suffering, is found in Him.